Optical coherence tomography (OCT) is one of the fastest growing areas of biomedical optics. Many of the functional extensions of OCT technology that were developed in the last decade, such as Doppler OCT, polarization sensitivity OCT, phase resolved OCT, and optical coherence elastography, started to generate clinically important information. I will report several on-going research projects in my laboratory that focus on translating functional OCT technology to solve specific clinical problems, including diagnosis and management of ocular diseases, sleep apnea, and cardiovascular diseases. The challenges and opportunities in translational research will be discussed. Dr. Zhongping Chen is a Professor of Biomedical Engineering and Director of the OCT Laboratory at the University of California, Irvine. He is a Co-founder and Chairman of OCT Medical Imaging Inc. Dr. Chen received his Ph.D. degree in Applied Physics from Cornell University in 1993. Dr. Chen’s research group has pioneered the development of functional optical coherence tomography (OCT), including Doppler OCT, phase resolved OCT, and optical coherence elastography. 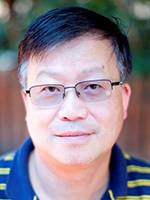 Dr. Chen is a Fellow of the American Institute of Medical and Biological Engineering (AIMBE), a Fellow of SPIE, and a Fellow of the Optical Society of America.